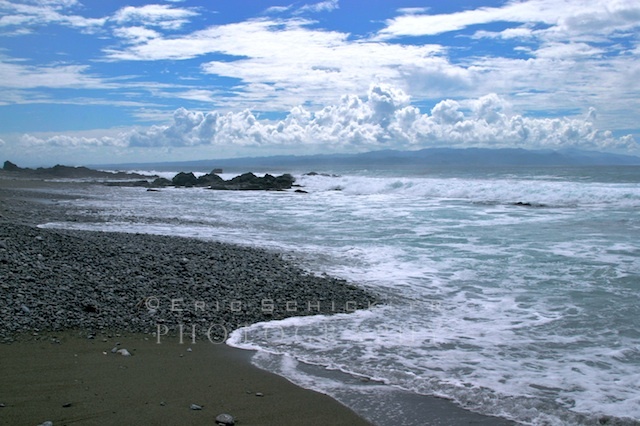 Cabo Matapalo is situated at a very strategic point on the southernmost tip of Costa Rica’s Osa Peninsula, where the Pacific Ocean meets the Golfo Dulce. 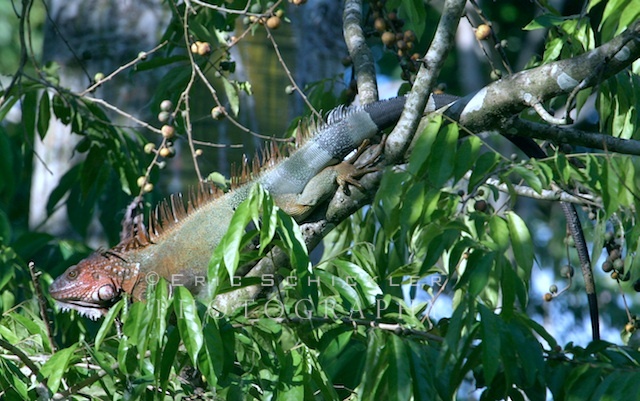 Its location isolates it from everywhere in Costa Rica, although it does have several upscale hotels. Named after the amazing strangler figs found in its forests, Matapalo is a most scenic ocean cape, with three outstanding beaches. Long-board surfers find high pleasures near Matapalo, with its well-formed beginner and intermediate-level right-point breaks. Advanced surfers from around the world flock across the gulf to Playa Pavones, which boasts the longest left-hand break in Central America. We were treated to some fantastic surfing exhibitions that afternoon at Matapalo, as some of the talented locals sliced up the 15- to 20-foot waves. Our day-long adventure into the Matapalo Highlands was billed as an audition for the next Tarzan movie. Sounds cool. Sign us up! Getting to the highlands required a fairly arduous hike in dense forest. It was very warm and very humid, a new kind of hiking adventure for we Coloradans, who are used to cool, dry hiking conditions. Our experience hiking in Colorado’s high altitudes did give us an advantage when it came to pulmonary stamina and endurance. Along the trail, our guides showed us how to find poisonous frogs’ hiding in the cool, moist areas under rocks. They’d simply chirp a few times and were quickly answered with a similar chirp from one of the frogs, revealing its general location. They expertly chose the correct rock to uncover and, VOILA!, there was our frog. These frogs are known for their aposematic patterns and vibrant colors, meant to advertise their toxicity and deter predators. They are also diurnal, or active during the day, rather than nocturnal like most frogs. As we moved further up the ridge, and the late-morning heat began to build, we found a very cool spring, that fed a large pool. It was the opposite experience of hitting the hot-tub, as we do in the snowy mountain ski towns of Colorado, after a cold, tiring day on skis. But the experience was equally rewarding. The cool swim was just what we needed to make it comfortably through the final leg of the hike, up to the location of the fabled tree. The ocean breeze greeted us as we reached the top of the ridge, which loomed some 450 feet above the gulf. 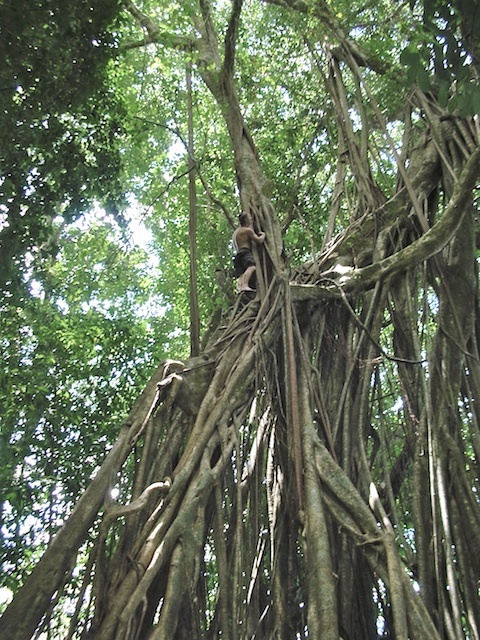 This was where our guides introduced our small group to THE local legend: a 120-foot, 500-year-old Strangler Fig Tree. Locals like the climbing and rope-swinging fun offered by this monolith, which is not exactly your average tree. It’s a fig tree that took over the tree that formerly held this beacon position on the sunny ridge. It’s a parasite tree wrapped around the hollowed out remains of a very large tree. Some explanation is needed to understand a competitive displacement process in the Costa Rican rain forest. Multi-layer tree canopies keep most sunlight from reaching the forest floor, and they are often quite devoid of growth. All things growing tall enough to get light compete for it fiercely. This causes an abundance of epiphytes and vines. Rather than grow huge trunks to hold their leaves up to the light, epiphytes and vines “reverse the rules” by growing from the top down. Epiphytes are plants that grow upon or are somehow attached to another plant or object for physical support. Epiphytes are primarily tropical and are sometimes called “air plants” because they have no attachment to the ground or other obvious source of food or moisture. They obtain water and minerals from rain and debris that collects on the supporting plants. Orchids, ferns, and some pineapples are epiphytes. Birds and monkeys eat the fruit of an epiphyte, then climb or fly to another tree, where they defecate. The seeds, mixed in the rich feces, get caught up on the bark or in the crotch of a tree high up in the canopy where there is more light. Vines quickly send roots down to the ground to get minerals and water. Epiphytes may grow against the tree or form a basin with their leaves. The basin will fill with a combination of water and feces from canopy animals and the epiphyte pulls minerals from the contained water. Perhaps no vine exhibits this clever behavior better than the Strangler Fig. The seeds germinate in the crown of the canopy and a root makes its way downward to the forest floor. Once it reaches the ground, it sends nutrients upward, and the fig up top reciprocates by dropping more roots down the trunk. Over time, the roots completely surround the trunk and begin to fuse; above in the canopy the fig is shading out the host tree’s leaves. The host tree falls victim, dies, and eventually decomposes. The strangle fig remains, however, towering above the forest floor, its fused roots creating a hollow trunk the same height as the long-gone host tree. The vines of the parasite become thick and strong, almost like giant steel cables. They are so strong that you can climb inside the tree, using the vines as a “ladder” to reach the tree top. Our guides showed us how to climb barefooted up the tree–90 feet up the tree! I go barefooted often in Colorado and have strong calloused feet, but next time I’m wearing some kind of protective grippy shoes, I’ll tell ya that. The climber’s hip harness gets tethered to a rope, which is hitched to a carabiner up top and anchored around the guide’s hip harness on the ground. The harrowing climb brought me intermittent bouts with height paranoia. I stopped halfway as the insanity of what I was doing hit me. Then I reassured myself—I was tethered to a rope! I wasn’t going to die if I slipped. But I didn’t want to go there. Who could predict the inherent dangers of falling, even with a rope on your hip-harness? Not to mention the embarrassment. And, God help me, what if Bob, the guy on the ground, in charge of my rope, therefore my life!, didn’t like me? I felt as if I were 200 feet up, but I had only climbed 45 feet. “Keep going!,” screamed the blonde-haired, muscle-toned 25-year-old Australian guide. This was the same woman who had scampered up to the 90-foot perch with the greatest of ease moments earlier, making it look oh so easy. Concentration is an amazing thing. It got me to the end of the rainbow. I spotted the ornamental bell they nailed to the tree that signified the designated “monkey perch.” I gave it the ceremonial jingle, at which came a round of applause from the peanut gallery below. I liked climbing trees as a kid, but it’s not something I’ve done very often as an adult. I can’t say I like heights all that much either. I wondered what I was doing up here, and thought about my future (and possible lack thereof). I thought about the money my parents spent on my college education, about our car parked back at Denver International Airport, and about my nonexistent life insurance policy. My contemplative moment was quickly interrupted by our Australian honey on the ground. “Okay, get ready, then at the count of three, JUMP! Like Tarzan,” she screamed in her cute accent. The half-naked, barefoot dude who matter-of-factly rambled through all the climb logistics and safety procedures minutes earlier was telling me to jump, and trust that he would prevent my glorious, Jungle Jim death. I had met him but two hours earlier, and was never shown any “Rope-Holding-Expert” certification papers, background-check reports, etc. And yet, there he was 90 feet below, with Ana and our new friends, the nice family from England, telling me to jump from Heaven to Earth…. and in just THREE seconds! “You can trust me,” he yelled with a laugh. I caught the encouraging, yet impatient stare of little Katrina, the fearless eight-year-old who had just climbed the darned tree like a monkey and jumped from it faster than you could say amusement park. Then, in chimed the howler monkeys in the trees near me, barking like sports-fan hecklers in the cheap seats. So with my time dwindling (down to one second now), I held fast and tight on the rope and threw myself overboard–off my safe and comfortable perch, to certain peril. There I was….. swinging, gasping, dangling, semi-panicking, just missing trees, getting belayed down gradually, but quick enough before the onset of cardiac arrest. After both feet felt the joy of reaching the forest floor, I caught my breath, said a very sincere prayer of thanks, then the thrill of it all sunk in. I suddenly felt a fantastic adrenaline rush and felt profoundly alive. Now I understood. Now I realized why adrenaline junkies jump out of airplanes, parachute of skyscrapers, ski off cliffs, bungee-jump bridges, paraglide off mountaintops, race dragsters, and attempt other assorted flirtations with death. Now I knew why Tarzan yodeled. Ana was equally stirred up as she was lowered down from her 90-foot jump, and I could see her visibly shaking from her adrenaline rush as she neared the ground. Her smile came back quickly, once she caught her breath. With everyone safely returned to the forest floor, high fives were rampant. I trudged up the trail, looking back and up at the monster fig, knowing I had reached a new pinnacle of personal courage. I had matched the bravery of an eight-year-old. The mood was spirited as we took our hike back down the ridge, legs fluttering along the trail with jubilation and a sense of accomplishment. We stopped at a favorite adventure spot, the 90-foot King Louis Waterfalls, where guided visitors and locals rappel from the top of the falls, down through the cascading waters and mist. Our guides had not only brought us back alive, but had taught us a bevy of cool things about the local geography, landmarks, vegetation and wildlife. Guides are good for that. They deserve their tips. I floated good ol’ Bob an extra 20 bucks for his dedicated hold on my rope. Ana and I, and our five British friends, all shared a new common bond. We had all survived a 90-foot leap from the notorious 500-year-old Strangler Fig tree. 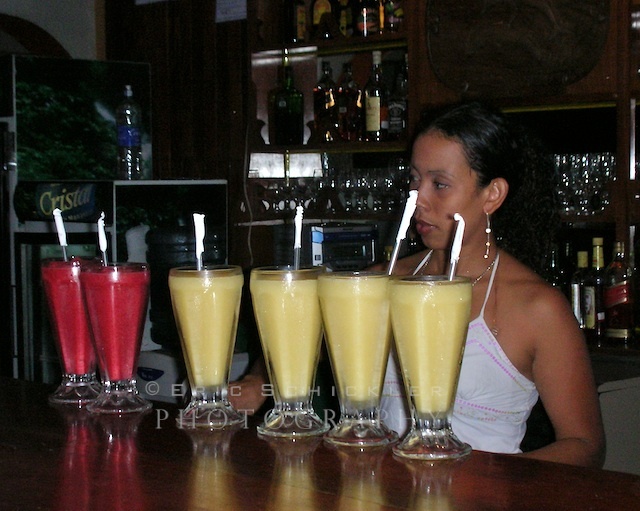 Back at the lodge, happy hour–highlighted by some very robust mango daiquiris–was never more rewarding. 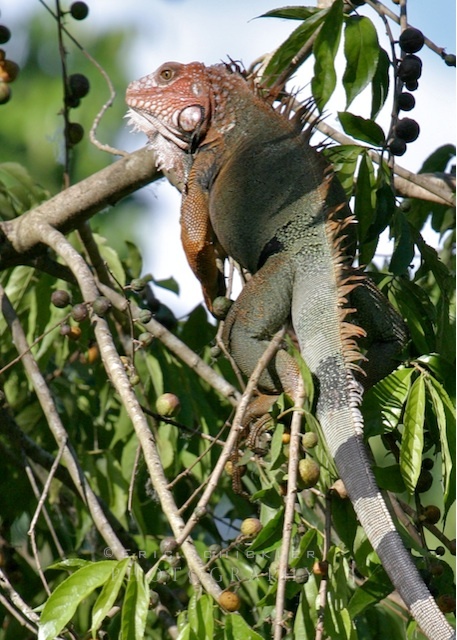 We settled into our easy chairs, sipped our drinks and watched the iguanas slither in the trees off the second-story lodge deck, as the sun set in the distance out over Golfo Dulce. Not a bad weekday in Costa Rica. “Pura Vida” was in the air, and was indeed having its wondrous effect on us. Our active day resulted in a very good night’s sleep. Until we were awakened at 3 a.m. by a crashing ka-boom! on the tin roof of our casita. We thought we were being shelled and, come to think of it—we were. A coconut had dropped from 25 feet above. Locals call them “grenades.” I can’t recall why I never heard one hit during the day. It was always at night. Hmmm. I sensed a monkey was involved, and he knew darned well what he was doing. All photography, text and artwork seen here is copyright-protected and the exclusive property of Eric Schickler Photography, Communication & Design. No downloading, use, reproduction, manipulation, sale and/or distribution permitted without express written consent. The calm, clear, deep waters of the Golfo Dulce, and the Pacific Ocean just a few miles off the coast of Matapalo, offer world-renowned fishing for many species. 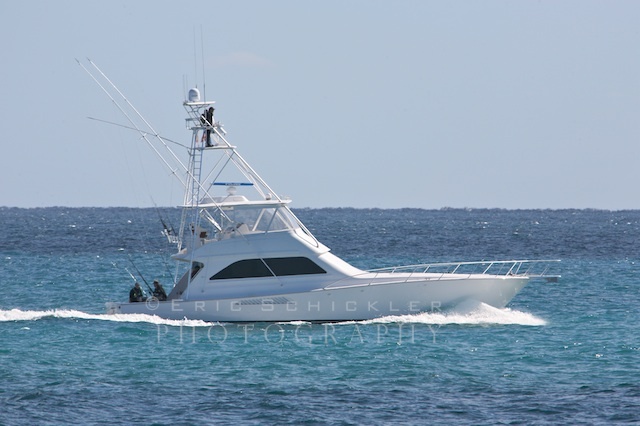 Offshore fish include black marlin, blue marlin, striped marlin, sailfish, dorado (mahi-mahi), yellowfin tuna, snapper and wahoo. Puerto Jimenez also offers some of the richest inshore fishing in the world, including roosterfish, jack crevalle, amberjack, snook, pompano, grouper, mackerel, snapper, blue travelli and more. 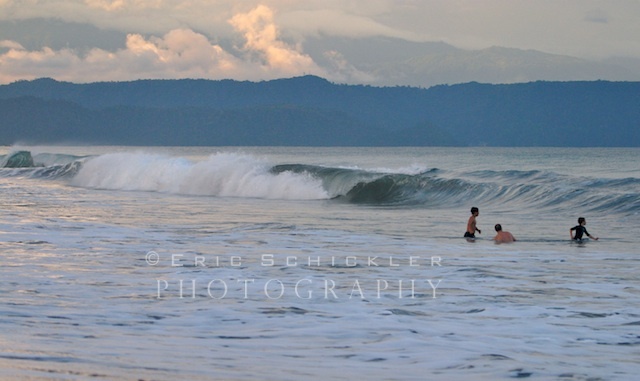 The waters of Golfo Dulce are exquisite—calm, clean, and, at 84 degrees, very soothing. The waves rolling onto shore are quite gentle in good weather, just a few feet high, but still fun for boogie-boarding or body surfing. Night-time swims are a special treat, especially with the warm glow of the moon overhead, floating in the hazy, moisture-laden sky. 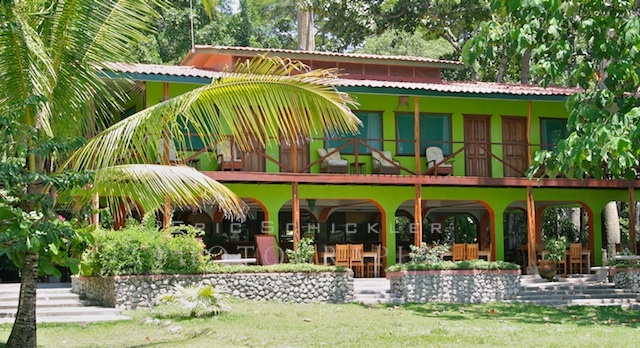 Iguana Lodge is situated near Playa Platanares and Playa Cienega, near the middle of an uninterrupted six-mile stretch of gorgeous beachfront. We saw just a few dwellings along the entire stretch, and most of them were tucked back in the jungle, far from the beach. We walked the beach routinely at dusk and dawn, covering miles at a time, and rarely saw another person. The resort’s resident dogs, “Osa” and “Bam-Bam,” often served as our escorts. One night was especially remarkable. We walked for two hours at low tide, wandering far from the beach to explore exposed sandbars far out in the water. On another night, our friends from England joined us. Derric decided he was going to skinny dip for a bit. We lost him for nearly 30 minutes as he waded far off into the surf. His wife held his shorts over her arm as we walked the beach; their presence was a direct reminder that we best reunite with him at some point. We knew he wasn’t going back to the resort without us. The waves kicked up a bit as a small weather disturbance rolled out over the gulf. I saw some boogie boards lying on the beach and decided it was play time. My first and only attempt at boogie-boarding that night resulted in total disaster. A big wave caught me the wrong way, driving my head underwater and into the sandy bottom. It also worked its magic on my shorts, pulling them down to my ankles. This made swimming difficult and provided me a shining opportunity to laugh at myself. Ana had a laugh too. After bringing my shorts back to their upright and locked position, I rose up out of the foamy surf, hair full of sand, salt water in the eyes, ears, mouth and nose, boogie board rendered useless–broken in half. To the shower I went, with head held low. Walking the beach was gratifying enough. But flying down the sand atop a frisky horse was something I’ll not soon forget. It was a far cry from the riding we are accustomed to in Colorado, often trudging up dusty, rocky trails, sometimes alongside precarious drop-offs. Galloping unencumbered and free, on soft moist sand, with an ocean breeze blowing at your face, was akin to skiing deep, dry, light powder on a sunny Colorado morning in Vail’s vast Back Bowls. No set trail, no obstacles, no people, no timeline, no worries. Just Ana and me and our guide, Ivan. Pura Vida! Ivan knew the area we were exploring very well, as if it were his back yard. And by golly, we learned that it was his back yard. His family had lived on this large plantation for more than 100 years. Iguana Lodge just happen to be his most recent neighbor. After our three-mile sprint down the beach at low tide, we toured along a cove near Puerto Jimenez, observing the fishing activities on the pier, and some tourists boarding the small tour boats. We wandered onto a trail into the jungle, and later emerged onto Ivan’s large plantation, where we followed a small creek we eventually needed to cross. It was a thrill to ride a “swimming horse,” with water up to my ankles! 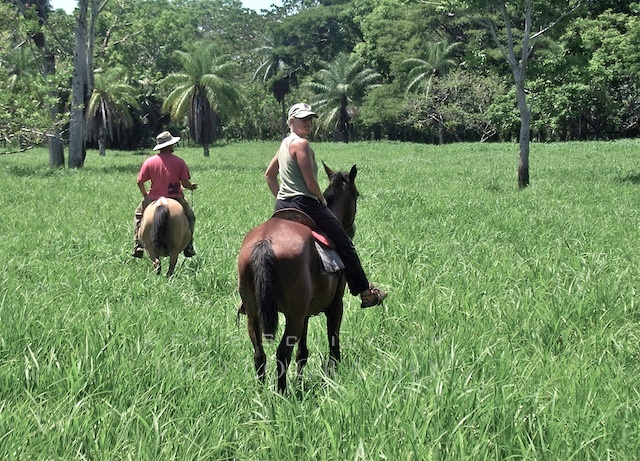 Suddenly we were back in a huge lush green meadow, just moseying along on Tico time. The meadow was surrounded on all sides by dense forest. As with the entire three-hour ride, it was peaceful, scenic, serene, ridiculously pleasant. We found a shaded, tree-lined dirt road, and this final stretch afforded us and the horses a welcomed cool-down as we completed yet another rewarding Osa adventure. That afternoon we meandered 300 feet along a trail through the trees to another part of the Iguana Lodge Resort. This historic building, called “The Pearl of the Osa Hotel,” has a handful of affordable rooms on the top level, and a restaurant and bar below. It is open to the public, so it’s a great place to meet some of the local people. We learned that The Pearl was a convenient spot to enjoy a quiet, relaxing lunch, and had an unencumbered view of the beach, the expansive gulf, and the cloud-forest mountains off in the distance across the gulf. Like the “Rancho Grande” Main Lodge, this restaurant and bar was also an open-air structure. At the Iguana Lodge Resort, anytime you were inside a structure, you still felt like you were outside! Every Friday night, the staff throws a special party at the Osa, called “Salsa, Pasta & Locals Night.” I found out later that the salsa was the dance, not the sauce you have with tortilla chips. A sad surprise as I did not wear my dancing shoes. The creativity and flavor of the various pasta dishes continued our week-long series of culinary surprises. I made a feeble attempt at learning some Salsa moves, but to no avail. The locals found me rather entertaining. Hey, I’m from Colorado! My natural reflex is to ski, not so much dance. Besides, I’m wearing sandals! Ana did a much better job faking it. But she looks great skipping rope; even better dancing. “Woo-woo, macha!,” the Tico men shouted. We met some very friendly locals; entire families showed up. We liked these people. We liked their zeal for simple fun. Everyone got along handsomely. 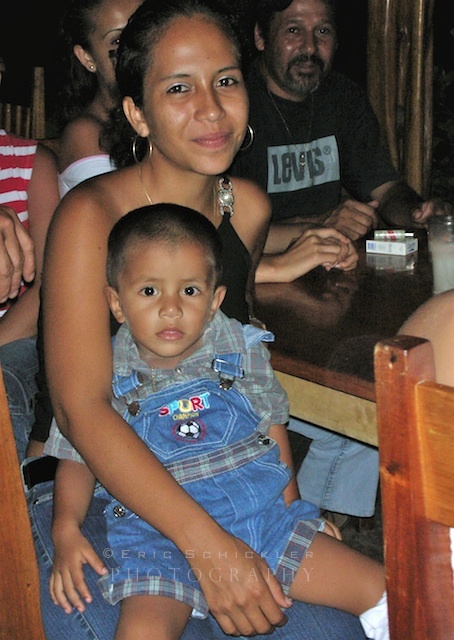 Live music is rare on the gulf, outside of Puerto Jimenez, so this was a treat for those who live nearby. The food, the camaraderie, the music, the dancing and the frozen fruit daiquiris were a a potent combination. It was quite the festive night. We slipped out of the wild weekend celebration early and returned to our quiet secluded casita. The rhythmic beat of the salsa band and party chatter were quickly replaced with the more soothing rhythm of rolling waves on the gulf. The next morning, we set off on an adventure that would lead us to a fairly famous tree on a mountain ridge overlooking the Pacific, at the very tip of the peninsula near the small town of Cabo Matapalo. The best feature of this town is its back-door access to Costa Rica’s incomparable Corcovado National Park, via Carate and the La Leona Station, just to its north. Carate is a hidden oasis with a small village and multiple treasures for nature lovers. Visitors will find forested mountains and–surprise!–seemingly endless pristine beaches. Indeed, the Osa Peninsula’s primary allure is Corcovado. There are plenty of superlatives that spring forth at the mere mention of this park’s name. — The single largest expanse of lowland tropical rainforest in Central America. — One of the highest rain forests in the world. 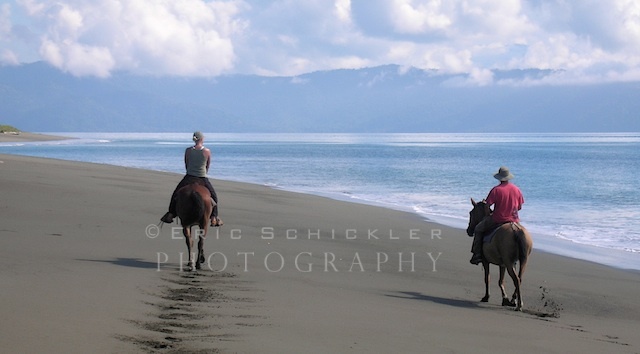 — The largest stretch of Pacific coastline primary forest in Central America. 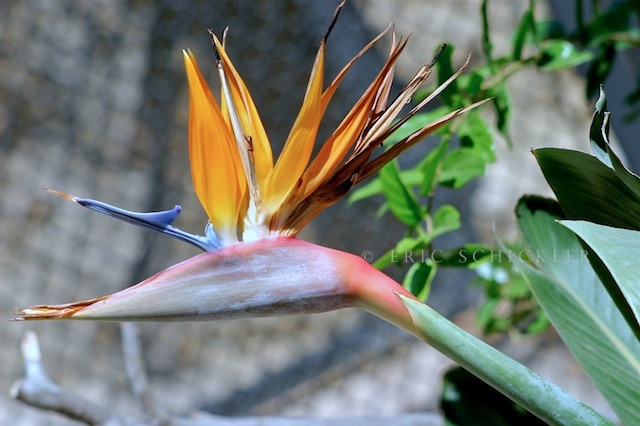 — Home to some of Costa Rica’s most endangered plant and animal species. It encompasses 103,300 acres of tropical rainforest teaming with rich biodiversity, including wildlife like jaguars, scarlet macaws, sloths, toucans, white-faced capuchins, the endangered Harpy Eagle, and even Baird’s Tapirs, the largest land mammal in Central America. All four species of sea turtle can be found here: the Pacific Green, the Olive Ridley, the Leatherback and the Hawksbill. Beware of running into the country’s deadliest snake, the very aggressive Fer-de-lance, which is rather common. The pristine park is very wet and remote, but has good trails and guided tours, enabling hikers to see a wide variety of flora and fauna. Three-day/two-night tours are recommended to even scratch the surface of exploration, and to reach the interior of the park. All photography, text and artwork seen here is copyright-protected and the exclusive property of Eric Schickler Adventure Photographer.